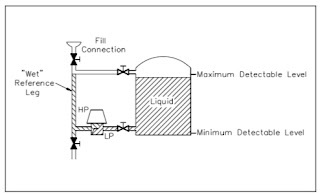 The differential pressure (∆P) detector method of liquid level measurement uses a ∆P detector connected to the bottom of the tank being monitored. The higher pressure, caused by the fluid in the tank, is compared to a lower reference pressure (usually atmospheric). This comparison takes place in the ∆P detector. 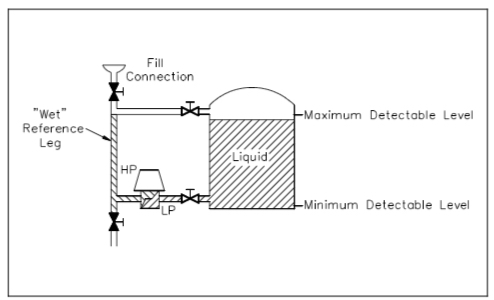 Figure 1 illustrates a typical differential pressure detector attached to an open tank. The tank is open to the atmosphere; therefore, it is necessary to use only the high pressure (HP) connection on the ∆P transmitter. 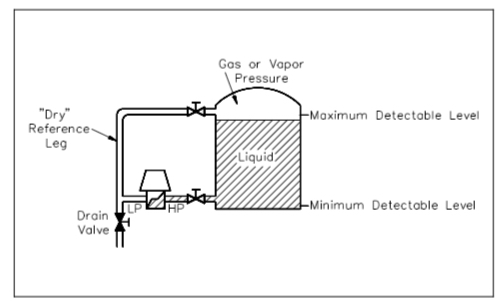 The low pressure (LP) side is vented to the atmosphere; therefore, the pressure differential is the hydrostatic head, or weight, of the liquid in the tank. The maximum level that can be measured by the ∆P transmitter is determined by the maximum height of liquid above the transmitter. The minimum level that can be measured is determined by the point where the transmitter is connected to the tank. Not all tanks or vessels are open to the atmosphere. Many are totally enclosed to prevent vapors or steam from escaping, or to allow pressurizing the contents of the tank. 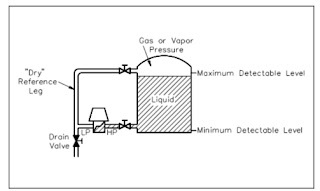 When measuring the level in a tank that is pressurized, or the level that can become pressurized by vapor pressure from the liquid, both the high pressure and low pressure sides of the ∆P transmitter must be connected (Figure 2). The filled reference leg applies a hydrostatic pressure to the high pressure side of the transmitter, which is equal to the maximum level to be measured. The ∆P transmitter is exposed to equal pressure on the high and low pressure sides when the liquid level is at its maximum; therefore, the differential pressure is zero. As the tank level goes down, the pressure applied to the low pressure side goes down also, and the differential pressure increases. As a result, the differential pressure and the transmitter output are inversely proportional to the tank level. Where the tank contains a condensible fluid, such as steam, a slightly different arrangement is used. In applications with condensible fluids, condensation is greatly increased in the reference leg. To compensate for this effect, the reference leg is filled with the same fluid as the tank. The liquid in the reference leg applies a hydrostatic head to the high pressure side of the transmitter, and the value of this level is constant as long as the reference leg is maintained full. If this pressure remains constant, any change in ∆P is due to a change on the low pressure side of the transmitter (Figure 3). The pressure exerted by a fluid material in a vessel is directly proportional to its height multiplied by its density. Hydrostatic pressure, or head pressure, is the force produced by a column of material. As the height of the material changes, there is proportional change in pressure. To calculate hydrostatic pressure, the density of the material is multiplied by the height of the column. The level of fluid in a column can be determined by dividing the pressure value by the density of the material. To find pressure in a column of water, a gauge placed at the bottom of the vessel. With the water having a density of 0.0361 pounds per cubic inch, the level of the fluid is calculated by dividing the head pressure by the density of the fluid. An example to determine the level measurement of a column of water that is 2 feet tall in diameter of 0.5 feet is solved by the following steps. The first step is measuring the weight of the vessel. Next measure the weight of the vessel with fluid. The weight of the fluid is determined by subtracting the weight of the vessel from the weight of the vessel with fluid. The volume of the fluid is then derived by dividing the fluid weight by the density of the fluid. The level of the fluid is finally calculated by dividing the volume of the fluid by the surface area. Hydrostatic pressure can only be calculated from an open container. Within a closed vessel, or pressurized vessel, the vapor space above the column of material adds pressure, and results in inaccurate calculated values. 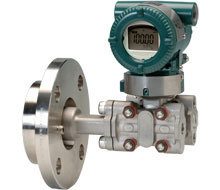 The vessel pressure can be compensated for by using a differential pressure transmitter. This device has a high pressure side input and a low pressure side input. The high-pressure input is connected to the bottom of the tank to measure hydrostatic pressure. 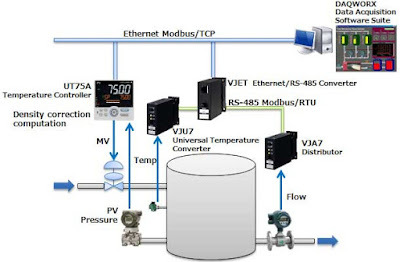 The low-pressure input of the differential pressure transducer is connected to the vapor space pressure. The transducer subtracts the vapor pressure from the high-pressure. 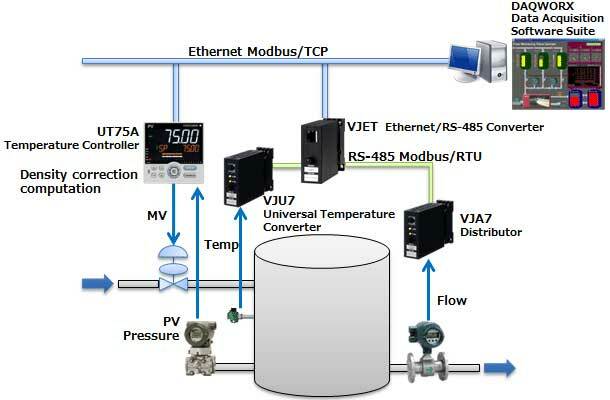 Resulting is a value that represents the hydrostatic head proportional to the liquid level. Protecting against tank overfill allows for process control industry professionals to mitigate potential risk to both their processes and process materials. Different products present different risks regarding tank overfill, but the work of preventing overfill is a universal component of safety, procedural effectiveness, and maximization of resources. If tank overfill does occur, a number of potential negative outcomes could result, especially in the cases of wastewater, chemicals, and petroleum products. Everyone, from management to methodology, needs to be working from the same ideal regarding safety as an inherent priority of process control. Instead of solely focusing on tank overfill prevention, many corporations have developed written instructions for every individual operator in an organization. Not only do these standards adhere to regulations, but they also meet environmental standards while eliminating accident risk. Six Sigma is an example of data-driven management meant to eliminate potential defects in safety procedures. The idea of pursuing perfection in all components of an organization may originally seem far away from overfill protection. However, previous attempts to confront tank overfill without consideration for the larger organization narrowed operational windows to only consider one part of the system. Expanding this system to include root causes of overfill prevention instead of solely the mechanisms for prevention has resulted in a more holistic approach to the integration of safety standards. Regulatory requirements for tank metrics, how to operate aboveground versus below ground tanks, and process material specific guidelines are combined with internal company codes. Those two elements are then fused with the Recognized and Generally Accepted Good Engineering Practices which are developed by industry associations. The tri-part approach has resulted in a more collaborative effort to combat tank overfill problems. One metric employed to prevent tank overfill-related dangers is to measure whether or not the tank in question has the appropriate room to accommodate abnormal process behavior. Considerations such as these mesh with evaluations of pipe size and whether or tanks need to be connected to relief tanks. Assessment of both operational and insurance risk means the entirety of the process must be understood and evaluated so that the interaction between the process materials can be predicted and then mitigated. Whether these components are raw materials, system components, or final products in the latter stages of the process, automated systems combined with operator diligence based on established methodology is the best way to prevent overfill and associated dangers. To discuss your tank level control and overfill requirements, contact Flow-Tech at https://www.flowtechonline.com or call 410-666-3200 in Maryland, or 804-752-3450 in Virginia. Warning: If it becomes necessary to service or remove the instrument from the system, power to the device is disconnected at the power supply. To begin make sure the float is at rest and there isn’t flow going through the meter. Using your hands or a strap wrench turn the cover counter clockwise to remove the cover from the housing. Remove the cover from the housing. The gasket should stay attached to the groove in the housing. Using a flat blade screwdriver with a 1/8" blade, hold the red alarm pointer and turn the screw counterclockwise to loosen the pointer, slide it to desired position on scale and tighten screw. Using a flat blade screwdriver with a 1/8" blade, hold the pointer and turn the screw to align with the “R” on the scale. It may take a few adjustments to get the pointer aligned to the “R”. To replace the cover, place the cover against the housing and turn the cover clockwise. Note, it will take several rotations to tighten the cover and the cover must be in contact with the gasket to keep a watertight seal. Download the instructions in PDF form here. For additional assistance, contact Flow-Tech in Maryland at 410-666-3200 or Virginia at 804-752-3450 or visit https://flowtechonline.com.